I really do believe that narcissistic financial abuse is one of the most excruciating things to try to recover from. Truly, to add injury to insult, not only are we smashed emotionally and mentally by narcissists, it is also very usual that the losses financially are hefty. Narcissists are loose and unaccountable they love to sidle up to people who will mop up their messes for them. They are also parasitical and entitled. They believe what is yours is theirs and as soon as the ship in the relationship starts sinking, the narcissist is already thinking about all the cargo they can hoist into their lifeboat – leaving you destitute and sinking behind. Often in these types of toxic relationships, narcissistic financial abuse is happening even before the cracks appear. After all, it always was all about them, so why would finances be any different? (Please don’t get confused about altruistic narcissistic being different with this, because they use ‘generosity’ to get narcissistic supply). Most people who connect with narcissists are good people, and we find narcissistic financial abuse incredibly difficult to comprehend. We have a conscience and don’t believe in taking any more that is rightfully ours. It’s not until we understand and accept how narcissists think that we can get our head around what they are up to and why they do it. The narcissist’s model of the world is one where they believe others operate as they do – and who gets in first wins. They truly believe that you are a bad person, and they are the victim. There is every twisted justification as to why you owe them, and why they are entitled to take from you. This has devastated more people than we could ever imagine and will continue to do so until people know how to empower themselves against it. 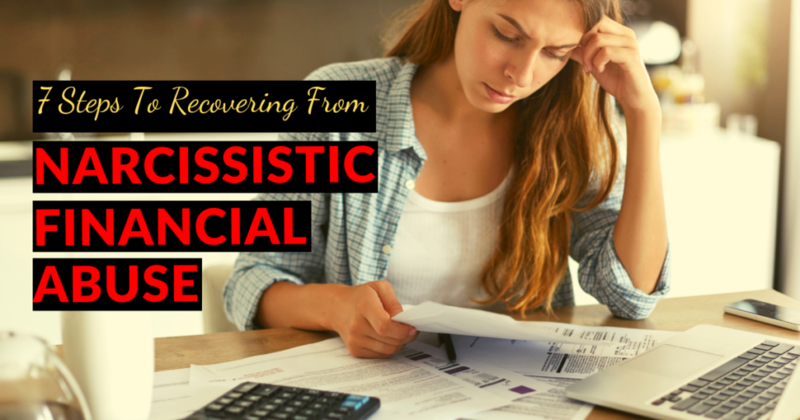 To help you learn how to do this, I wanted to grant you these very important 7 steps that I have found highly successful regarding healing from narcissistic financial abuse. Start thinking like the enemy. Secure away all that you can and don’t leave yourself open to any more financial abuse. Think that the unthinkable is possible. Many others and I have suffered incredible narcissistic financial abuse, including account theft by narcissists, such as them forging cheques. Tighten and close down any hatches that the narcissist can get to your stuff through. And I mean it when I say, leave no stone unturned, because you have no idea exactly what a narcissist is capable of doing. Also, if you are leaving a narcissist, know that anything of value, if left behind could be ensnared by the narcissist and used to keep you hooked for narcissistic supply, or even sold out from underneath you. Plan wisely and have things removed when the narcissist doesn’t know and store them where the narcissists can’t find them. A very dear friend of mine is going through this right now. She didn’t believe that her husband who displays narcissistic traits would ever stoop so low. She left the marriage and the home, and now everything that is of value to her, he will not let her have access to. Those who experienced narcissistic financial abuse, including myself, tried to smooth things over, be nice, cut a deal, come to arrangements and the like. All this does is keep feeding the narcissist energy and keeps you hooked into them. They are not interested in playing fair, doing the right thing or making arrangements. They simply want you to hurt, and them to win and gain the egoic significance of knowing that they have you caught up in their web. Often what happens is while you are trying to make arrangements and deals with them, the narcissist is angling for how, now, they can get even more money or stuff out of you. They know, because we are good people, that if they ‘give us their word’ we will try to keep the peace, do the right thing and may even be susceptible to lending them more money or doing more favours for them so that they will come good on their ‘promise’. The truth is narcissists are only telling us what we want to hear to make this possible. As we know, narcissists love to take your money and your stuff and hold it over you to keep you hooked to them – it’s fabulous A-grade narcissistic supply. Know this: if you have no way of legally retrieving what is yours, accept it’s not coming back to you. Firstly, the narcissist has convinced themselves you owe them at least what they have taken. Secondly, them withholding is used as a tool to torture you, as malicious vindication for the narcissist considering what they believe you did to them. There is only one way out of that hellhole, let go and do everything you can to make PEACE with your losses. Sometimes we have to pay to have our rubbish removed. The truth is our soul health is worth far more than any physical thing. I know, when I lost copious amounts (pretty much everything I had worked my entire life for), I had to work very hard with Quanta Freedom Healing to release the excruciating trauma of that. It worked. I did reach complete peace, and I know so many others who have also. Please know, it can be hard to shift our pain and rage at the narcissist for skipping off into the sunset, apparently thrilled with taking what is ours, while we are left behind broken and destitute. Through inner healing and aligning ourselves with the truth, we can let this go too. Narcissists are never having a great time, no matter what they do or don’t have. It is all illusionary. But WE can generate real, and incredibly soul gratifying lives. Which leads us to the next important step. This is where you can turn inwards to make your greatest mission, vocation and purpose about healing, self-integrating and valuing your soul. Through narcissistic financial abuse, and losing all that we thought ‘was us’, we get to release the identity hold of our ego and come home to truly loving ourselves unconditionally, without props, just as ourselves. When you heal through these layers, the relief is indescribable regardless of what you do or don’t have yet. I can’t tell you what happened for me when I accepted this as my greatest necessity, and all else took a back seat. For the first time ever, I started to rejoice in the wealth of the small things, and gratitude filled my incredibly humble life. The support and love that started entering my life genuinely, for really the first time in my life, was overwhelmingly beautiful. And finally, I was present enough to see it and be with it. If you, possibly for the first time ever, drop the ego need to rebuild and be seen as accomplished and successful, and let go of the need for stuff and acquisitions now, and instead put the wealth of your soul and its recovery right up to your highest priority – I can’t tell you how much all of Life/Source/God will start to nourish and flourish you genuinely beyond measure. This is a vital step that many people miss after narcissistic financial abuse. If you just try to push on and get back out there in the world to recover the money and resources you lost, you are not truly honouring yourself, and your recovery will be missed. I can’t tell you enough how this is one of the most serious mistakes I see people make. Yes, it’s true we must survive and keep food on the table and the roof over our head. So, do that, but take the pressure off yourself to fly and succeed. Your wings are broken and need to mend before you can fly again. Then you will be able to be aligned with abundance and flow, without fear. My life changed dramatically when I cleared the numerous (I had tons) of blocks regarding revenue and wellbeing. I also had terrible self-sabotaging beliefs about trying to earn and buy people’s love and very scanty boundaries regarding money. Deep in my healing, I realised how I was never going to be successful no matter how hard I tried. These traumas had kept me locked into painful financial trajectories like heat seeming missiles over and over again. If it hadn’t been for two narcissists bring me to my knees financially, and be being supremely dedicated to finding, releasing and healing the traumas that I discovered with the NARP work – I would not be living the incredible, abundant and fertile life I live today. I also saw that every time I released the fear of debt or not bring enough or having lost 40 years of life effort financially that miracles started to appear in my life, including financially. Because my Inner Identity no longer needed wealth to fulfil it because it was becoming more and more whole on the inside, abundant opportunities and my own inspiration started to organically come. Not because I needed it, because I was BEING it. Since cleaning up my painful financial beliefs, after honouring and healing my soul health first, my life has changed beyond description on these topics, and so will yours. Many of us have struggled with this next important step. After narcissist number 1 my son was devastated that we lost his home. He was traumatised beyond measure regarding the step down in accommodation that we had to make. I promise you that, when I led the way and accepted that what was happening to us was a part of our soul evolution, including his, and got ‘okay’ with it, he followed. I am so proud to say now that my son is not superficial and doesn’t prize ‘stuff’ over people or his soul. We both generated incredible building of our lives, and he is a successful self-actualised balanced adult financially. Rather than there being ‘scars’ concerning what we went through, the rebuild, starting with our souls, was some of the most powerful and abundant lessons we ever learnt. So many people work in vocations they don’t like, just to make money. That isn’t a living. It’s a dying. My suggestion is, whilst you are healing and aligning with your soul, to cover your needs with a job that is not going to be all-consuming, even if it isn’t your dream purpose. Then as you release trauma and heal, start asking yourself the following questions: WHO am I? What lights me up? What do I want to unfold from within me to make a difference? What unique contribution can I make? I also suggest doing specific Quanta Freedom Healing Shifts on any traumas getting in the way of you aligning with the answers to these questions. Many people who have done this, have fast-tracked toward the unfoldment of their true soul’s missions, that have not only gratified their sense of purpose magnificently but also provided grand abundance to them as well. Which is exactly what happens when we get on soul and on song! I promise you that when you devote to healing and releasing your True Self, your mission will emerge from within. It starts as feelings and urges and the more you shift out the doubts and blocks within you, the more this will come into focus, bringing opportunities, possibility and miracle in to cogenerate it with you. I hope that these 7 steps have provided you with a way through that will grant you clarity, direction, relief and personal power. I look forward to answering your comments and questions about this very important topic.